Traditional Plastering Services for Stockport and High Peak areas. John Oldham Plastering provides a traditional plastering service throughout the Stockport areas of Cheshire, the High Peaks in Derbyshire and the Tameside areas of Gee Cross and Hyde. John specialises in domestic plastering and also provides a small building alterations, building maintenance and building repairs service too. Work is backed by £2M public liability insurance. Bonding plaster, Browning plaster and Hardwall plaster application. PVA Bond or SBR Bonding is normally applied as a matter of course on all plastering jobs. PVA Bond is a multi-purpose bonding agent, primer, sealer, cement and plaster admixture that adheres to most common building materials. Ideal for priming unsound surfaces prior to plastering or painting, for general dust sealing on flaking paintwork/walls etc. SBR Bond is a latex based, water resistant bonding agent and admixture for use in areas subject to humidity, dampness and continuous water contact. It improves water resistance of mixtures by forming a reinforcing polymer that increases long term durability and flexibility. Adhesive scrim joint tape is always used over joints and cracks and to join plasterboard edges. In certain cases, when necessary, stronger external render mesh may be used for added strength to a plaster repair. Here's a couple of recent plastering projects. For more visit our Plastering Project Case Studies. 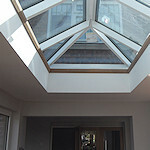 Perennial Windows created this lovely orangery sun room with a lantern glass ceiling in Offerton, Stockport. My job was to insulate the ceiling and all steelwork with a solid K-Span insulation board, then plasterboard and skim. All walls were also plasterboarded with the dot 'n' dab method and then plaster skimmed. 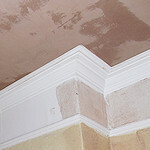 The plasterering to existing dining room walls and ceiling were also made good. Overboarding and replastering of a bedroom and lounge ceiling in a property on Longhurst Lane, Mellor. Both ceilings were badly cracked and taking down the old ceilings was an option. However, due to an ornate Edwardian plaster corniche in situ, both the customer and I were very concerned that this could be damaged and possibly collapse. The solution was to overboard the ceiling with new plasterboard and use a stop-bead to create a neat edge up against the corniche without compromising its integrity. This made it a straight foreward job to finish with a smooth plaster skim without any damage to the historic corniche feature.